Proactively hunt for security weakness. Pivot from attack surface discovery to vulnerability identification. Find security holes with trusted open source tools. Get access to tools used by penetration testers and security professionals around the world. Hunt vulnerabilities from the attackers perspective. Simulating real world security events, testing vulnerabilities and incident response. 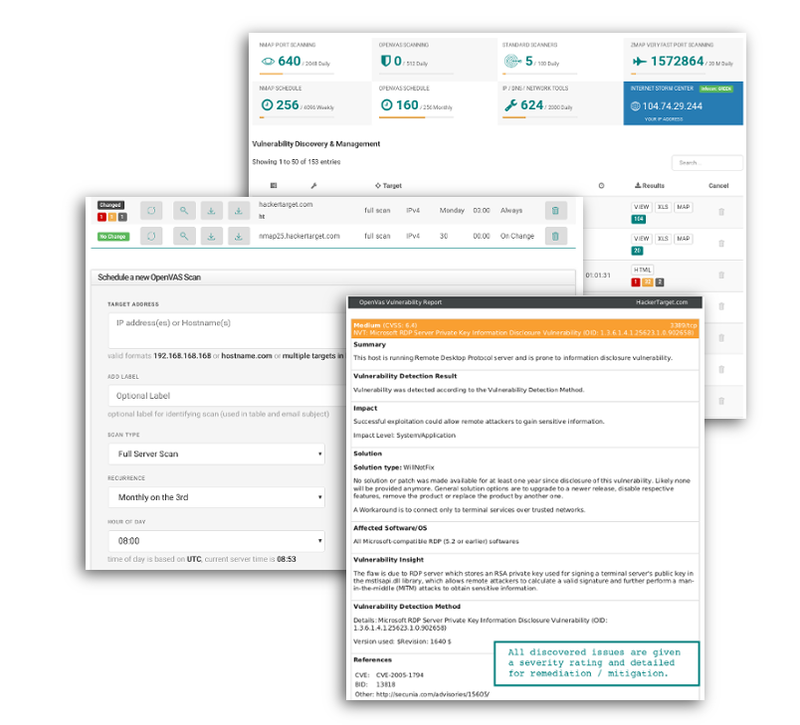 Discover the attack surface with tools and open source intelligence. Protect your network with improved visibility. Over 1 million scans performed last year. Our vulnerability scanners have been launching packets since 2007. Fixing security issues requires you find them. Identify the issue, re-mediate the risk and test again to be sure. Fast servers optimized for vulnerability scanning across the Internet. No maintenance or installation required. 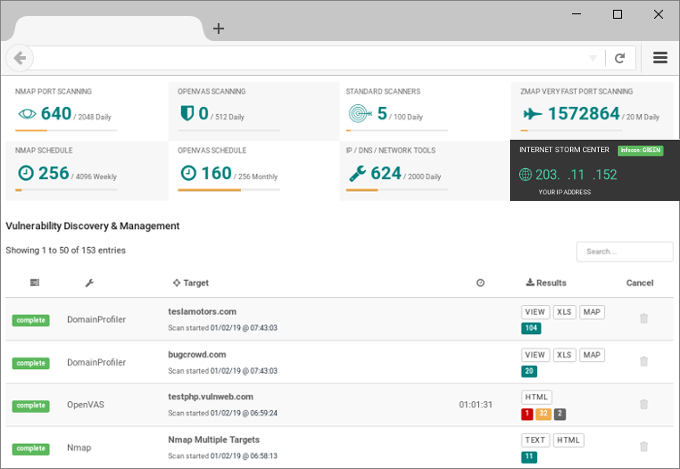 Discover why thousands of customers use hackertarget.com to monitor and detect vulnerabilities using our online vulnerability scanners. The suite of tools are used daily by systems administrators, network engineers, security analysts and IT service providers. 7 day full refund available if you are not getting immediate value! Launch vulnerability scans with a simple form. Select required options and wait for your results. Being a hosted service there is nothing to install or maintain. Scan when you want from anywhere. Schedule OpenVAS and Nmap for ongoing vulnerability detection and firewall monitoring. We have 13 online vulnerability scanners for testing different areas of the security assessment cycle; including information gathering, application discovery, network mapping and vulnerability discovery. In addition are another 15 Free Network and IP Tools. Test open ports with our hosted Nmap online port scanner. With the ability to scan all ports and complete net blocks the port scanner is one of our most popular scans. OpenVAS is a powerful open source vulnerability scanner that will perform thousands of checks against a system looking for known security vulnerabilities. Now available is access to Zmap a very fast port scanner. Sweep multiple class B network ranges for open ports. The "Internet" knows whats on your perimeter, do you? Sqlmap is one of most accurate sql injection testing applications available today. Access our online hosted version to conduct a fast HTTP GET based Sql Injection test. Vulnerable web scripts, configuration errors and web server vulnerabilities can all be detected with this online version of the Nikto Web Scanner. WhatWeb & Wappalyzer web service reconnaissance from HTTP headers and source HTML. Determine technologies and scripts in use. The most popular content management system in the world is also the most attacked. Get a FREE WordPress security check and find installed plugins. Joomla is another popular CMS well known for its many and varied plugins and themes. Use our online scanner to detect security problems with a Joomla installation. Another one of our content management security testing scanners; the Drupal security scan discovers security related issues focused on a Drupal installation. Quickly analyze TLS/SSL with this SSL Scan. Find weak encryption and certificate details. Uses SSLyze and Nmap NSE scripts. Attack surface discovery tool that passively finds Internet assets. Including IP addresses, subdomains and banners. FREE Information gathering tool that focuses on a single web server and finds virtual hosts on the server. It will then perform malware and reputation checks against the discovered websites. Our Professional Services Team are ready to do the testing and reporting for you. When you simply need a trusted third party for your external vulnerability assessment. We are focused on providing maximum value for our clients. Backed by years of experience in penetration testing and vulnerability analysis let us give you a leg up and take your security to the next level.